Winged eyeliner can go either one of two ways. It can be your BFF or your arched-nemesis. Unfortunately there is no secret to executing the perfect cat eye. It really is just a practice makes perfect motto in terms of nailing a solid technique. However, having the right products undeniably aids the process. Reflecting back on some old eyeliner disasters, the biggest obstacles I had were firstly liquid eyeliners being too runny making it impossible to work with the product. Secondly, I remember being so disheartened when using the much-loved and raved-about L’Oreal Paris Super Liner Carbon Gloss for the first time. It totally flaked off my eyelids within an hour of applying it! Major makeup meltdown. One beauty hack I have learned over years of trial and error is using a felt tip liquid liner, arming myself with cotton buds and literally just winging it (bad joke). The felt tip style eyeliners are my personal favourite as working with the side of the pen along my top lash line enables a (sometimes) flawless application. After marking along my lashes, I angle the tip upwards as if to continue on from the bottom lash line, again utilising the side of the pen to mark out another thin line. This should give you the foundations of your feline flick. The next step is being patient and smoothly connecting everything together. Side note, unless you are a pro, don’t attempt winged liner in a rush, everything WILL be destined to go wrong that day. So, on to the tools. Above are my all time favourite products for getting my winged eyeliner on fleek to the fullest. 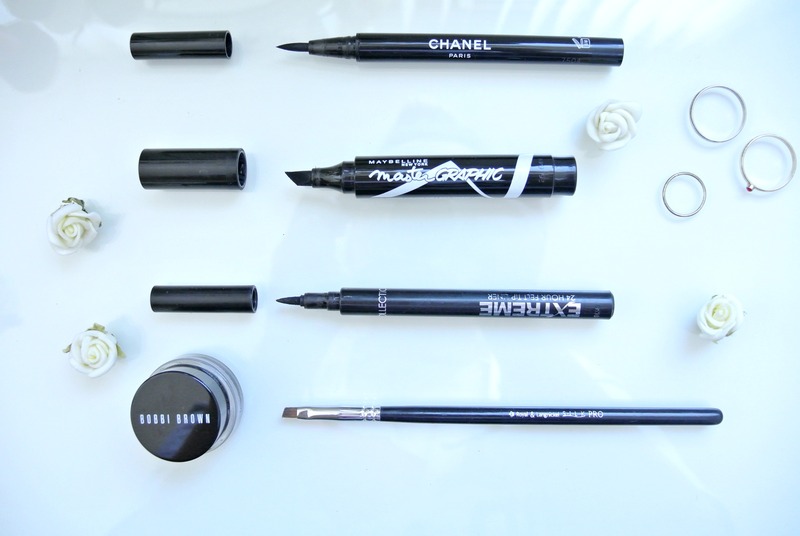 My top three felt tip liquid eyeliners of choice are: Chanel Écriture De Chanel, Maybelline Eyestudio Master Graphic Eyeliner and the Collection Extreme 24 Hour Felt Tip Liner. My favourite is the cheapest of the three, Collection’s option. Costing only £2.99, the pen has a flexible nib making it as easy as possible to apply, perfect for winged liner virgins. The formula lasts all day on your lids without the need of a primer. When I have more time to do my makeup I also love using the Bobbi Brown Long Wear Gel Eyeliner with an angled brush. It applies seamlessly without any dragging and does not budge. I am dying to try Kat Von D’s Tattoo Liner. What is your favourite way of obtaining the perfect wing?